Sea of Glass: REVEAL! Bead Soup Blog... PartyOn! I had a wonderful time with my first bead soup exchange! I humbly admit it was a challenge for me using components out of my level of confidence. Just call me "Simple Simon"...I can do elaborate in glass, but not for complex jewelry design. Notice the lovely detail on the clasp. Such a big pot of soup had enough for 2! And even a 3rd set! As you've seen, the soup ingredients yielded 3 full recipes! And they WILL get consumed! At any rate, I am absolutely delighted with ALL of the results! I just hope my partner, Kitty, agrees ;-) and I'd like to thank her again for sending such a delicious soup! Check it out! The participants are from ALL over the globe. Click the map to view full screen. So many :-) so lovely creations!! OMG CIS!!!!! what gorgeous creations you came up with!!! they are really pretty!! Creative imagination steady flowing!! Oh these look so lovely. I adore the stamped tags on the earrings. I stopped by her blog too. She did a wonderful job with the stash you sent, and hand dyed ribbon? How cool. 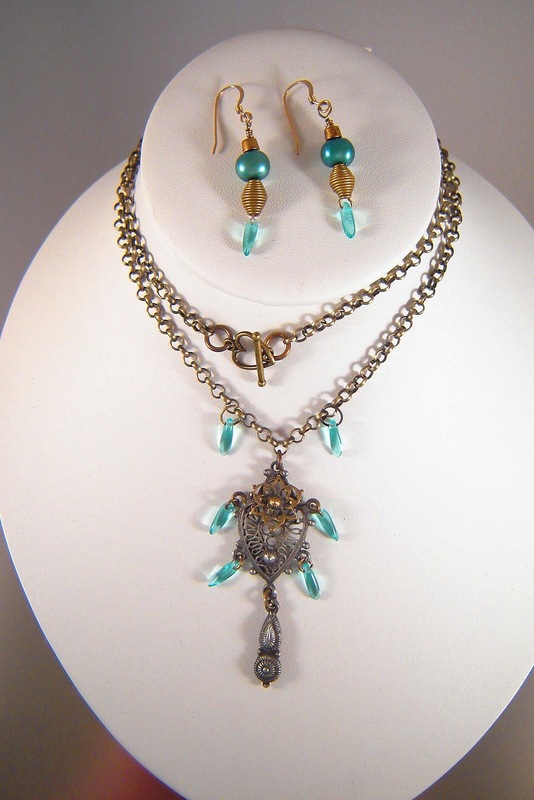 These are beautiful Cynthia, love the little acorns, the pendant on the second necklace to me it looks like an elagant sea turtle, and on the third I like your combination of pearls and lamp worked beads. All three sets are gorgeous! Wow... wow... amazing, just gorgeous work! Wonderful! 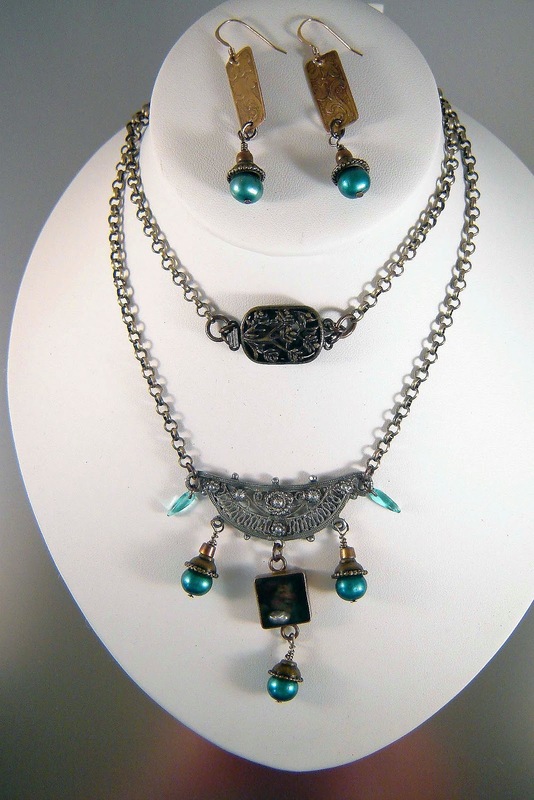 You have created several terrific pieces of wearable art. I like your use of color and texture, I also love the clasp. Thank you for sharing. Cheers! Cynthia......very KEWL!!! I love the acorns! You did a wonderful job. Your last piece is absolutely amazing. I enjoyed seeing how you used the "soup" I sent you. I don't think your were outside your "level of confidence"! It was great having you as my BSBP partner! I think that the third set is my fav. You did a wonderful job with all your soup!! Such lovely colors!! Love that first one with the little acorns, but they're all really lovely! Beautiful creations, love them all, especially those cute acorns. Love them! Really sweet and elegant finished pieces. Nice pieces and wonderful colours! Love all of your pieces and I know you'll end up with one or two or say three more lovelies! Oh woops -- I be tired. You're not Kitty! Cynthia Cynthia Cynthia. And now I see that my first comment must not have published -- hit me with a stupid stick. I LOVE what you did -- the acorn, the multi-strands -- you had nothing to be afraid of! I'm proud of what you did! I hope you'll join me next time! The badge and dates will be posted tomorrow, the 19th! Wow - I love what you created! I love those acorns you came up with around her pendant - ingenious! You done good girl!!! Love those acorns especially the color. 3 great pieces. I love the acorns! They are great as dangles around the focal. But all the pieces are very pretty. You were certainly busy creating - and you made some beautiful sets from your soup! You have made some lovely pieces! So many helpings of beady beauty - the acorns are precious! Wow - 3 sets - awesome work. Your pieces have a royal feel to them - very nice! I love your work. you did a wonderful job. Well done!! Your soup ingredients were so very yummy looking! Your really made three stunning necklaces. Well done!! Ooooh, such wonderful pieces! I think the first necklace is my favorite and the acorn earrings, way to cute! Love!! Nice group of pieces. The acorn idea is very cute. I adore all three sets. Gorgeous designs!!! Scrumptious soup and those tasty little acorns! Such talent! What a nice collection of beads and what beautiful jewelry you made from them. They are lovely. What beautiful things you made with your soup! I just love the focal that looks like a turtle! I love all of your pieces! what lovely pieces you created from your soup!!! I was delighted by all the photos! Nice to meet you! Lovely jewellery! My fave is the third set. Really like the colours and bead mix -- and the simple design looks so elegant. Great job! Very nice and so much soup I am too full!! LOL. You made the most of your soup with some lovely creations. I, too, thought the pendant looked like a sea turtle. Still making the rounds and tasting all the bead soups. :) Both are very pretty. Love the idea of the acords for fall. Beautiful creations and those acorns are so nice! They are all beautiful pieces! I love the second one especially... it reminds me of a lacy, filigree turtle. Looks good at choker length too!